When you think of Mercedes-Benz, you think of many things. Luxury. Opulence. Stateliness. Power. Probably the best interiors anyone is making right now. 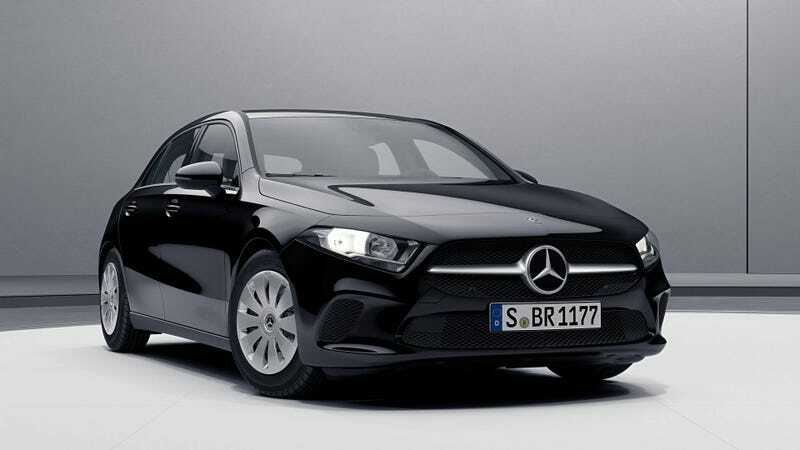 But when you go to Europe and get a 2019 Mercedes A-Class, and check none of the boxes, you get none of these things. And it’s delightful. I have an obsession with base-spec European “luxury” cars with bargain-basement trims and features that would never fly in America. You know, like an E28 BMW 5 Series from the ’80s with cloth seats and a tiny diesel engine, or any Mercedes taxi cab in the Middle East. It’s a window into another world, or more accurately, an example of how diverse car lineups can be without us Americans even realizing it. Anyway, this is true of the A-Class for sure, as it’s Mercedes’ smallest non-Smart car. While the new A-Class is a lot nicer than the car it replaces, and seems a big improvement over the CLA and GLA as well, it definitely has some stuff in mind for fleet sales and frugal customers. It may wear a Mercedes badge, but it’s closer to a Corolla than any S-Class. As first noticed by Motor 1, the base version gets fabric seats, regular halogen headlamps instead of LEDs, one (1)-zone climate control, and my favorite, 16-inch steel wheels with plastic hubcaps. Or maybe there’s one other thing that’s my favorite: the six-speed manual between the seats. What a nice and rare thing to see on any modern Mercedes! Even if the gearbox isn’t that great—and being essentially an economy car, it probably isn’t—I bet it’s a fun companion to the base 163 horsepower gasoline engine. At the same time, it’s a testament to how good even cheap modern cars are, since it also has lane keeping, rain-sensing wipers, active braking and driver awareness systems included. Anyway, this steel-wheel-having, manual gearbox, cloth-seat Mercedes-Benz is alright in my book. I can’t wait to rent one the next time I’m in Europe and no one will give me a press loaner.